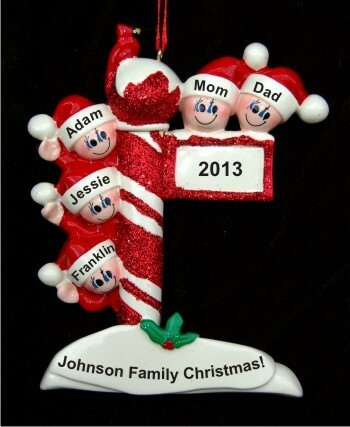 Share the joy of being a family this holiday season with the Christmas pole for family of 5 personalized Christmas ornament that arrives in our custom velvet drawstring bag. Brightly colored and generously glittered, these adorable family ornaments personalized by hand look wonderful on the tree or anywhere they produce the most smiles. Perfect for your family or others on your gift list, the Christmas pole for 5 personalized ornament will add a splash of holiday joy to your decorating this and every year.